Entrance [to the] Jama Masjid, Lahore. bl.uk > Online Gallery Home	> Online exhibitions	> Asia, Pacific and Africa Collections	> Entrance [to the] Jama Masjid, Lahore. 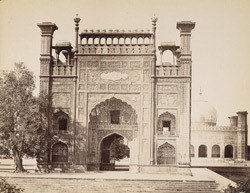 Photograph of the gateway of the Badshahi Mosque, Lahore, Pakistan, taken by an unknown photographer in the 1870s, part of the Bellew Collection of Architectural Views. Lahore, the capital of Punjab province, is considered the cultural centre of Pakistan. Islam came here after the advent of Mahmud of Ghazni in 1021 AD, and it was subsequently ruled by a succession of dynasties of the Delhi Sultanate, followed by the Mughals, the Sikhs and the British. It reached its apogee under the Mughals, known as the Garden City and with enough architecture to rank it with other great Mughal centres like Delhi, Agra and Fatehpur Sikri. The Badshahi Mosque, one of the last great Mughal monuments, was built in 1673-74 by the Emperor Aurangzeb (ruled 1658-1707). Constructed of red sandstone and decorated with white marble, it was modelled on the Jama Masjid of Delhi, and departs from the local tradition of tile-facing. Set on a high plinth within a walled enclosure adjacent to the western wall of Lahore Fort, the mosque has three domes and an arcaded facade with octagonal minarets at the corners, and is said to be one of the biggest mosques in the world. Its interior is richly decorated with painted stucco.